Morgan Amalfitano's fine first-half strike earned West Brom just their third Premier League away win of the season and put the Baggies level on points with fellow strugglers Norwich. The visitors deservedly led at the break when Amalfitano fired a classy low shot past goalkeeper John Ruddy. 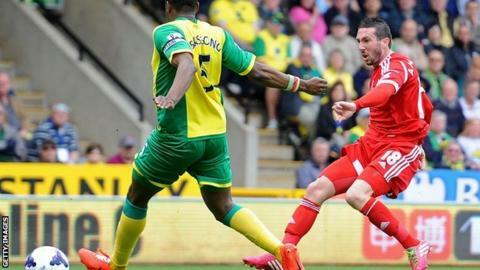 Norwich improved greatly and hit the bar through Gary Hooper's stinging shot and a Robert Snodgrass free-kick. But they could not find an equaliser and avoid a fourth loss in six games. "West Brom had a bit of luck in the second half but overall you can argue that they deserved to take the three points. They were organised and resilient throughout and dangerous in attack in the first half. It's a vital victory." The Canaries, who had not lost at home in the league since December, created enough chances to turn things around after a dismal opening 45 minutes but are now only five points clear of the relegation zone following Fulham's win over Aston Villa. The victory was crucial for a Baggies side who have still only managed six league wins all season and face a tough run-in, including games against Arsenal, Manchester City and Tottenham. It came courtesy of an impressive first half against a City side whose play was characterised by misplaced passes and careless defending. The Baggies did almost gift the visitors a goal inside a minute when Gareth McAuley's back-pass almost saw Hooper nip in. But any fears of the dressing-room bust-up between James Morrison and Saido Berahino affecting their performance were soon dispelled. West Brom looked the better side, with their defence solid and Stephane Sessegnon and Matej Vydra lively in attack. Graham Dorrans tested Canaries goalkeeper Ruddy with a swerving shot and Amalfitano smashed an effort into the side-netting. The hosts finally created an noteworthy opening when Johan Elmander shot woefully over the bar with a first-time 18-yard strike after good work by Snodgrass. But almost immediately West Brom went ahead when Amalfitano showed great composure to take advantage of Norwich left-back Martin Olsson's slip and send a superb low strike across goal and into the far corner. West Brom had chances to double the lead, but Jonas Olsson failed to anticipate a free-kick and Ruddy made a blocked save to deny Vydra on a fine counter-attack. Just before the break, Norwich finally tested Baggies keeper Ben Foster, but the England international made a fabulous one-handed save to keep out the Swede's instinctive header. Norwich had not lost at home since December before this defeat while the Baggies had just two away league successes on their travels this season, having won at Swansea City and Manchester United. Norwich, whose own run-in sees them face Fulham next week - followed by Liverpool, Manchester United, Chelsea and Arsenal - were a totally different proposition after the interval, dominating possession and territory. Elmander almost got on the end of a teasing centre, Hooper smashed a shot onto the angle of bar and post and within a minute Snodgrass also hit the bar with a superb, curling free-kick from 30 yards. West Brom were standing firm but their last-ditch defending and desperate blocks were in stark contrast to the controlled display of the opening period. The increasingly influential Snodgrass fired a shot well over after good interplay with Hooper, but the chances dried up in the closing stages and, with home supporters' frustrations growing, Baggies substitute Berahino could have sealed the win late on. "A team that has displayed discipline on the pitch and has played as they did today - well and together - demonstrates that there is a good spirit in the camp and that we are a family. "I think the players have shown today exactly what they want and how to go about achieving it. Both Saido and James, plus all the players, have just shown how important they are for us. "These three points really move us closer to the end and make our route a lot easier. I think the Tottenham game next week is really important. If we are able to win against Tottenham the future for us will be a very happy one." Check out all the best action photos from today's Premier League games on the BBC Sport Facebook page. Jonás Gutiérrez (Norwich City) wins a free kick in the defensive half. Attempt saved. Saido Berahino (West Bromwich Albion) right footed shot from a difficult angle on the left is saved in the bottom left corner. Assisted by James Morrison. Attempt missed. Luciano Becchio (Norwich City) header from the centre of the box is close, but misses to the right. Assisted by Jonás Gutiérrez with a cross. Substitution, West Bromwich Albion. Liam O'Neil replaces Zoltán Gera because of an injury. Delay in match Zoltán Gera (West Bromwich Albion) because of an injury. Substitution, Norwich City. Jonás Gutiérrez replaces Martin Olsson. Substitution, West Bromwich Albion. Zoltán Gera replaces Graham Dorrans because of an injury. Delay in match Graham Dorrans (West Bromwich Albion) because of an injury. Russell Martin (Norwich City) wins a free kick in the defensive half. Attempt missed. Saido Berahino (West Bromwich Albion) left footed shot from the left side of the box misses to the right. Assisted by Stéphane Sessegnon with a through ball. Substitution, Norwich City. Luciano Becchio replaces Johan Elmander. Attempt missed. Russell Martin (Norwich City) right footed shot from outside the box is high and wide to the right. Corner, Norwich City. Conceded by Youssuf Mulumbu. Attempt missed. Robert Snodgrass (Norwich City) left footed shot from the right side of the box is too high. Assisted by Gary Hooper. Substitution, Norwich City. Nathan Redmond replaces Wes Hoolahan. Offside, West Bromwich Albion. Stéphane Sessegnon tries a through ball, but Morgan Amalfitano is caught offside. Corner, Norwich City. Conceded by Ben Foster. Attempt saved. Robert Snodgrass (Norwich City) left footed shot from outside the box is saved in the top right corner. Assisted by Wes Hoolahan. Robert Snodgrass (Norwich City) wins a free kick in the attacking half. Gary Hooper (Norwich City) hits the bar with a right footed shot from the right side of the box. Assisted by Joseph Yobo.